Although Star Wars Celebration is less than a month away, hype for the currently untitled Episode IX is starting early this year. An unofficial poster has been leaked online, showing our favorite characters from the sequel trilogy in various heroic poses, sporting their newest costume changes. While this is mostly likely an internal piece of marketing material from Disney and not an actual poster, the Internet is understandably excited about our first real glimpse into the final installment of the Skywalker saga. One of the things that makes this feel more like an original poster is all of the details in the background. Fans can easily spot some familiar ships – Resistance A-Wings, and, of course, the Millennium Falcon, as well as some unfamiliar ones. There’s an X-Wing, which could possibly be Poe’s new X-Wing after the tragic loss of Black One, and a new TIE Interceptor variant, which has all the makings of a new LEGO ship. Rey definitely captures the most attention, which makes sense considering that she is the new face of this generation’s Skywalker saga. Whether Skywalker by blood or not, it looks like she managed to find a way to repair Anakin Skywalker’s lightsaber after its destruction in the last film. Whether she’ll be using it throughout the film or if she’ll swap it out for a custom lightsaber staff like fans have been hoping for, that secret is most definitely not going to be leaked any time soon. One of the most interesting things about Rey in this image is her outfit. The pure white stands in sharp contrast to her previous grey ensemble and she looks like she’s possibly embraced her role as the last Jedi. But beyond the symbolism, her outfit seems to be a mix between the outfit she wore in The Force Awakens and Padme’s iconic white ensemble. Could this be another hint to her possible Skywalker lineage, or perhaps just another figurative nod to show that she’s a Skywalker in spirit? Speaking of borrowed clothes, who do we know that carries a blaster, wears a vest, and has Correllian bloodstripes (those are still a thing, right?) on his pants? It looks like Finn raided Han’s closet after the events of The Last Jedi. It’s our first look at Finn with longer hair, all but confirming that there will be a bit of a time jump between the events of the last film and this one. He looks the part of a smuggler, but fans who were hoping for a Force-sensitive Finn might be disappointed: there’s nothing in his ensemble that would indicate he’ll be joining Rey in taking down the dark side by Force. Completing our main trio, Poe’s outfit looks like a cross between Indiana Jones and Tomb Raider. He doesn’t look like a pilot, although Oscar Isaac hinted in a recent interview that he might be doing some flying with Rey in the Millennium Falcon. Still, this is Star Wars, and it’d be remiss if he and BB-8 were absent from any epic space battles that we know are going to take place. Hopefully we’ll get the answer to the question of who really is the best pilot in the galaxy: Poe Dameron or Han Solo’s only son? Speaking of Kylo Ren, it’s good to see the helmet back. The red cracks in the helmet help give him a villainous look without seeming too disruptive, although the mask doesn’t look anywhere near as destroyed as it seemed after the events of the last film. His lightsaber seems to be the same, although his cape looks draped around him and hanging off over his arms in a weird way, which could indicate a slight costume change. Considering his new role as Supreme Leader, it makes sense that his costume look might change somewhat. 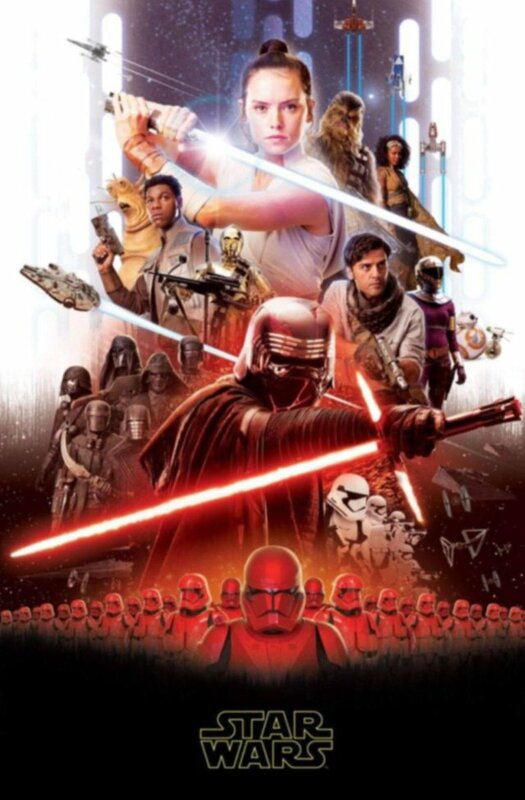 Probably one of the most interesting things about the poster overall is the addition of the Knights of Ren. They look like they were a bit photoshopped in there, but it’s our first real look at the Knights that were surprisingly absent from the last two films. They look similar to The Force Awakens concept art, and seem to be using medieval weapons in favor of lightsabers. While the Internet has been buzzing for years as to whether or not Ren’s Knights are Force sensitive, their use of these weapons seem to indicate that they’re not, although only time will tell. Either way, hopefully fans will get the answer to how this group came to be and what purpose they now serve. Are they only there to serve Kylo Ren, or are they supporting the First Order as a whole? General Hux is absent from the poster, but considering his diminished role in the prior installment, that isn’t much of a surprise. Instead it features Stormtroopers that look like they’ve maintained more of The Last Jedi style of helmet and new Red Stormtroopers that have a nefarious look to their helmets. Is this a new legion of Stormtroopers we’ve never seen before? Is this something Kylo Ren created himself? We’ll just have to wait and see. Also on the poster are a few new characters. We have Keri Russell’s Zorri, who seems to be a bounty hunter with a strangely shaped helmet. Kerri Russell recently told Stephen Colbert that she has “the coolest costume” and it’s not hard to see why, although she seems to have considerably less armor than some of the other bounty hunters we’ve come across. We also have Naomi Ackie’s Jannah in the back behind Chewbacca. Her ensemble seems to fit in with Poe’s, and seems more reminiscent to the style of clothing you’d expect to see on a desert planet. In another leaked costume photo, she has a bow and arrow, which looks like an awesome new addition to Star Wars weaponry. Speaking of bowcasters, C-3PO is definitely the most underrated aspect of this poster. 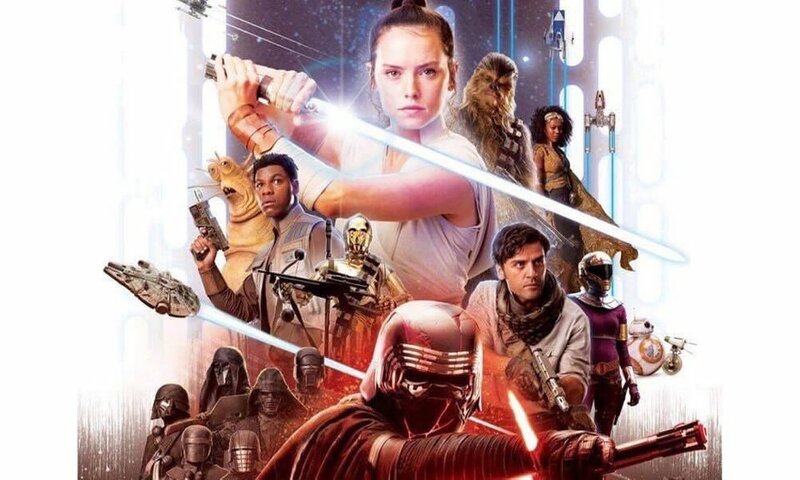 He seems to have snuck into the middle of the poster, and while he’s usually standing alongside R2-D2, this time he’s all by himself, holding a weapon. Does this mean that C-3PO is finally going to get in on the action? He saw a little bit of it in Attack of the Clones but it’d be interesting to see C-3PO battle alongside everyone else. Considering all he’s seen and done, it makes sense to close out the Skywalker saga by giving him a bigger role. R2-D2 seems to have taken a back seat, as he doesn’t appear anywhere on the poster. Instead we see BB-8 off to the side, with a different kind of droid. He seems like he could be some sort of maintenance or spy droid, although it’s hard to tell from just one image. There’s also another new alien that’s standing behind Finn. Is he just a cool new Star Wars alien, or is he important to the plot in some way? Aside from the aliens we saw on Canto Bight, the new Star Wars films have been lacking in alien exposure. Maybe this is a turning point; after all, the Resistance is going to need all the help that they can get taking down the First Order, both alien and human alike. Unfortunately the General of the Resistance herself, Leia Organa, is absent from the poster, although this makes sense. Since Carrie Fisher’s passing, the scenes that she’ll be in are unused footage from the previous installments, and no one knows quite how much screen time she’ll have or what role she’ll play. It makes sense that they’d keep her out of most of the marketing material to keep it a surprise for fans on opening day. Although Leia’s absence makes sense, there’s a few other characters that are absent as well. Rose is missing, although considering the poor reception her character received, they might have decided to downsize her role. Lando is also absent, although he’s seen in another leaked photo showing a Solo-like shirt with his signature cape. Luke is also absent from the image, although considering no one knows what role he’ll play or how involved he’ll be, he’ll most likely be kept out of most marketing material as well. Supreme Leader Snoke and Captain Phasma are absent as well, making their deaths in The Last Jedi seem pretty permanent. While it’s possible Snoke might come back in another form, Phasma’s lackluster appeal after The Force Awakens and her quick defeat in The Last Jedi didn’t really give her character time to shine as brightly as her polished silver armor. While this one leaked piece of information won’t tell us everything we want to know about Episode IX, it’s a good starting point. While a title and a teaser trailer will drop at Star Wars Celebration, we’ll find out more about it in the coming months as merchandise starts to hit shelves, as well as the second season of Star Wars Resistance, which might drop a few hints as to what we can expect in the time period between the two films. So how do you feel about this leak? Are you excited to finally get some more info about Episode IX? Are there any details we missed? Let us know your thoughts in the comments below and, as always, May the Force be with you!